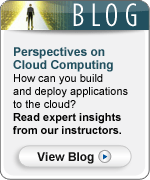 Cloud computing is the hottest new technology in IT. Microsoft’s platform for implementing cloud-computing is called Windows Azure. With Windows Azure you rent servers and storage for a low monthly fee. Under the hood, Windows Azure provides virtual machines running Windows 2008 server and Internet Information Services. You can specify how much RAM and how many CPU’s you want to allocate for your application. You can also specify how many instances of the virtual machine you want to start. You only pay for the resources you use and you can add and remove resources any time to handle peak periods. Windows Azure also provides cloud-based storage. Azure storage is secure, fault-tolerant and incredibly cheap. Everything written to Azure storage can be encrypted and access to the data can be made using https secure protocol. All data written to storage is replicated at least three times, across multiple devices, and across data centers. Incredibly, storage only cost 5 cents per GB per month. Microsoft provides a .NET SDK that makes programming to Azure easy. There are also Azure tools that integrate with Visual Studio that make creating and deploying Azure applications easy. .NET programmers will be happy to know that their existing programming skills can easily translate to programming cloud-based applications when using Windows Azure. If you’d like to know more, Learning Tree has a 4-day course that covers everything you need to get started programming Azure applications, Windows® Azure™ Platform Introduction:Programming Cloud-Based Applications. Over the past year, I’ve written a series of articles on getting started with Windows Azure. You might like to work through the following links to learn more. Hopefully, this tutorial will get you excited about the benefits of cloud computing with Windows Azure.